As I was preparing for this website to go live, I considered the writing themes I wished to explore. In between revisiting my own creative process, the various steps that led from an idea emerging (as if of its own accord) in my head to my expressing that idea in words on paper and pixel, I kept thinking about authors who inspired me. One who kept returning to me was Sarah Hoyt without whose encouragement, I might never have started serious work on the epic. In the summer of 2012, she e-mailed, asking me to read a draft of A Few Good Men, wanting a gay man’s perspective on this Science Fiction novel with a gay male protagonist. Not only did I agree to read the book, but I also began a correspondence with the author who has since become a friend. Sarah wanted to know if the hero Lucius Dante Maximilian Keeva, or Luce, was believable as a gay man. And I found that he was. Not just that. I found the book to be a fast–and a fun–read. Just good old-fashioned Sci Fi pulp except instead of the guy getting the girl, the guy gets the guy. When (back in 2012 before I had a kindle), I received my advance copy electronically, I printed out various pages and read them while I did my cardio. So engaged was I in the book that I often found myself working out longer than I had intended, indeed, as long as each section lasted (each section as thick as my heavy-duty stapler could accommodate). And when the section ended, I hungered for more. To me, a gay reader, it was more than just pulp, more that just space opera. It was a chance to read about a gay character who, in some ways, corresponds to an almost idealized version of ourselves. Note, I say “almost.” For despite his flaws, he at least presents a (somewhat) noble demeanor and shows a bit of derring-do. He becomes a man who does the right thing–even in difficult circumstances. All too often alas, in literary fiction, we have seen the opposite, gay men depicted as whiners, victims of an unfair society or, in mainstream and Science Fiction, as lonely people who live apart from their peers, rarely connecting with others and never succeeding in romance. And Luce succeeds in romance. After suffering the loss of one lover, he finds in another both the companionship we all crave and the encouragement we all need. Although born to the aristocracy, at the beginning of the book, Luce finds himself in Never-never, a secret underwater prison. 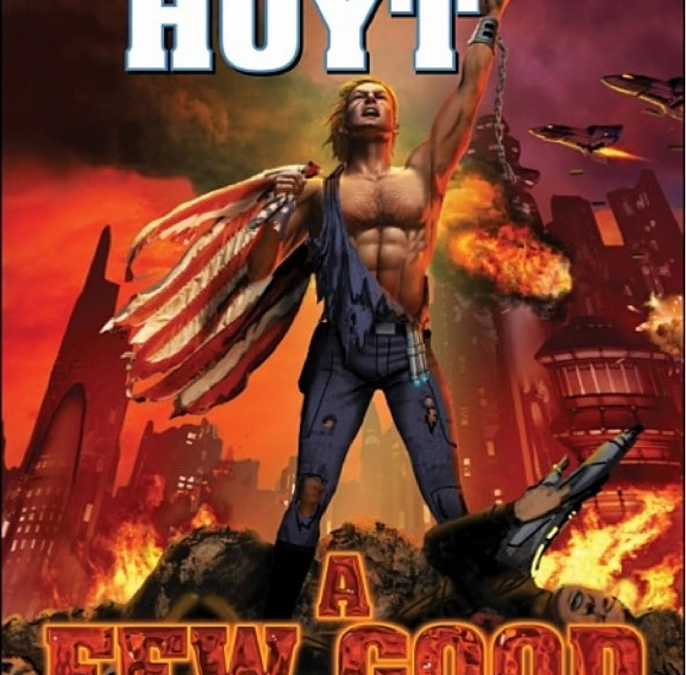 And this despite the fact that he is the son of a “Good Man.” In Hoyt’s near-future dystopia, “Good Men” are what lords were in the Middle Ages. And here, each runs a seacity, little fiefdoms built in the midst of the Atlantic. Even as he succeeds in escaping, Luce tells us that he had tried to take his own life. And yet the prison wardens had worked hard to keep him alive. Luce wonders why. Perhaps, they were acting at his father’s behest. But, given the tensions between the two, that seems strange. And while speculating about his father’s intentions, he constantly “talks” with Ben, younger brother to Samuel, the manager of his family’s estate. But, Ben is now not more than a voice in his head, the echo of the man he once loved–and was forced to kill. (He wanted to spare him the pain of further torture). This disembodied voice will guide him almost as Jiminy Cricket guided Pinocchio in the Disney classic. In death, Ben has become, in some ways, his conscience. Luce will never get the chance to ask his father if he had acted to keep him alive in prison. Once he is free, our hero learns that the old man–as well as his brother–have been killed. As a result, he returns home not as the prodigal, but as a Good Man himself. Here, he faces renewed questions about his family–and his past. Why did his late brother, he wonders, in his brief tenure as a Good Man, come to act increasingly like their father, even down to his choice of bedroom decor? His return brings more than just burdens and questions. He finds that Samuel’s son Nathaniel has taken an interest in him. This interest grows into much more than a friendship. Nat starts teaching him about Usaians, which Luce had thought were a “religious sect” with “roots in a mythologizing of the old country that used to occupy much of the North American territories.” After Luce has signed up with this movement that seeks to restore the old republic, he learns that many of his household staff had already joined. Indeed, were named for the Founders, his first lover for Benjamin Franklin, his second for the under-appreciated Revolutionary War general Nathaniel Greene. At its core, A Few Good Men is a story about two men who fall in love while joining the fight for liberty, about a man, who happens to be gay, willing to risk his life for his beloved and his beliefs. It is a fun-filled, fast-paced read. While it has many of the qualities of good, old-fashioned space opera, it is more than that–at least to me. This book portrays gay men as most of us aspire to be–and as a good number of us already are, not whiny weaklings bemoaning our fate, but confident leaders, willing to take charge of our destiny. In the end, Luce becomes a hero, finding a man to love as he discovers a cause to reverence. And is that hero not the “secret identity” of many a gay man?